Lawyers of the International Protection Centre Oksana Preobrazhenskaya and Karinna Moskalenko described one instance of unlawful use of pre-trial detention where suspects of a crime have already been held in detention without a court ruling for four years. On 25 May 2015 director of the non-profit International Protection Centre Oksana Preobrazhenskaya, project director Karinna Moskalenko, manager of the Centre Valentin Moiseev, and lawyers Valentina Bokareva and Yulia Nasonova held the latest round table in the series of ‘Strasbourg Get-Togethers’. The round table was held in an unusual format. The event took place in the International University in Moscow, thanks to which students were able to take part in the discussions. The website HRO.org has already written about the pre-trial detention which enjoys extreme popularity among Russian investigators and judges. At the same time, they not only ignore, and for no good reason, alternative forms of treatment of suspects in a case, but sometimes violate the law. The instance described by Oksana Preobrazhenskaya and Karinna Moskalenko concerns a prosecution where the case materials run to 300 pages and concern 21 individuals who allegedly constitute an organized group accused of illegal drug trafficking. At the same time it must be borne in mind that, as is well-known, the European Court of Human Rights never considers a case on its merits, and does not consider the issue of the guilt or innocence of the applicants. The European Court is only concerned with the question of the observance of the European Convention on Human Rights and Fundamental Freedoms. About one third of the defendants in this case have brought applications to the European Court of Human Rights. Some of these were arrested in 2010, others in 2011. In December 2012 prosecutors passed the case on to a court of first instance, but for unclear reasons the trial did not begin. In July 2013 the court returned the case to the prosecutors. At the same time, Oksana Preobrazhenskaya pointed out, the court left the pre-trial detention unchanged without indicating the length of time for which it should be extended (!). At the present time the accused are still in pre-trial detention centres, and the trial has not yet begun – already more than four years on (!). This case shows a gross violation of both domestic law and the European Convention, the lawyers of the International Protection Centre believe. 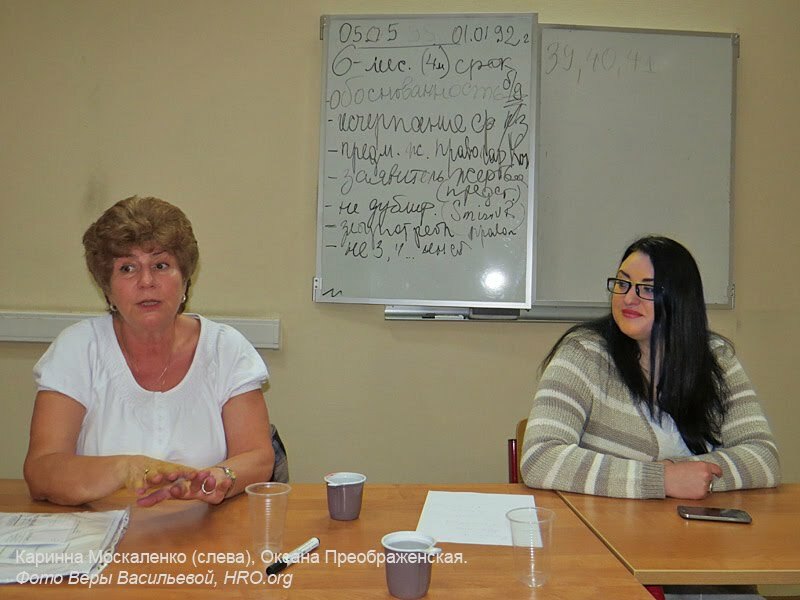 Oksana Preobrazhenskaya and Karinna Moskalenko stressed that Article 109 of the Criminal Procedure Code of the Russian Federation lays down that the maximum period for pre-trial detention in the investigation of crimes is 18 months. At the same time, this is only possible in exceptional circumstances in relation to individuals who have been accused of extremely serious crimes. On the expiry of this period there are no legal grounds to hold the suspect in pre-trial detention, even if they are suspected of a serious crime. As the lawyers pointed out in their application to the European Court of Human Rights, in this case there has been a violation of Article 5 of the Convention (‘right to liberty and security of person’), in particular paragraphs 1 and 3. The Strasbourg Court has already found this application admissible and has submitted a series of questions about it to the Russian government, including on the issue of exceeding the 18-month limit for pre-trial detention. Oksana Preobrazhenskaya considers the answers given by the Russian Federation unsatisfactory. At the round table there was also discussion of other cases taken up by the International Protection Centre, including those with a high public profile. In particular the case of the first application to the European Court of Human Rights by former Yukos employee Aleksei Pichugin was discussed. "This is one of those rare cases where the European Court has taken the position that it is impossible to restore the right to fair non-judicial investigation without a [new] trial in fair conditions being held,” Karinna Moskalenko said. She expressed the opinion that “in this case the Presidium of the Supreme Court, taking into account the serious interest of the authorities in the outcome of the case, has ignored the decision of the European Court of Human Rights”. The International Protection Centre has regularly held ‘Strasbourg Get-Togethers’ over a number of years. Those taking part in the discussions include not only staff members of the Centre, but also other lawyers, applicants to the European Court of Human Rights, journalists and many others who take an interest in the latest news from the Starsbourg Court. Since the closing of the Independent Press Centre, where the Strasbourg Get-Togethers were formerly held, the round tables have not acquired a permanent new home.